Road Safety Week has been and gone. to thank all the organisations, schools and community groups who got involved to support the Bike Smart campaign. Our press release got some good pick up at the beginning of the week, with Brake spokespeople popping up on various radio and TV stations across the country to talk Bike Smart. We have also had great engagement on Twitter and other social media platforms, with many of our partners and followers sharing and retweeting our messages. Learn more: For anyone who missed it, the full Road Safety Week press release can be found here. Want to find out more about how you can be a Bike Smart driver? View our short animation here. Get involved: Tell us about your 2018 events. 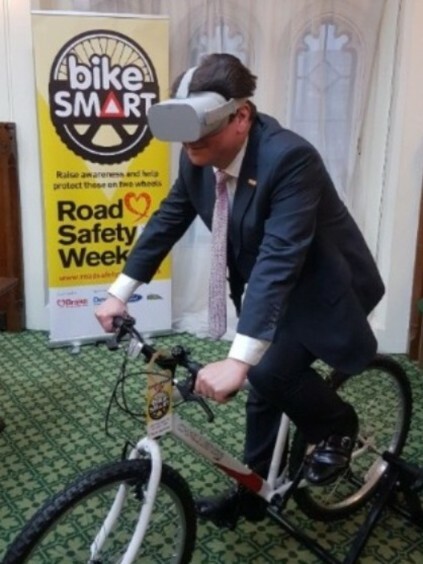 Brake held a drop-in session in Parliament during Road Safety Week, for MPs to come along and learn more about the Bike Smart campaign. Many also tried out the WheelSwap VR experience that Ford kindly provided for us. They all received a template press release to go out in their local media to spread our message. In total 36 MPs attended. There was a good cross-party mix and many are keen to engage with us further. Towards the end of the month, there was a Westminster Hall debate on ‘road safety and the legal framework’, where many of our supportive MPs had the opportunity to raise our concerns about the legal system surrounding road traffic offences, including the definitions of careless and dangerous driving, hit and run sentencing, and implementing the tougher sentences for death by dangerous driving and death by careless driving under the influence of drink or drugs. Many MPs used the opportunity to call for a review of road traffic offences, with the Justice Minister, Rory Stewart MP, in attendance to respond to the debate. We hope this will be a positive step in furthering our Roads to Justice campaign. Find out more: Click here to read a transcript of the debate. In late November, the Department for Transport (DfT) announced its response to the Cycling and Walking Investment Strategy call for evidence, to which Brake submitted evidence, with a 50 point action plan on how to make the roads safer for people cycling and walking. This included measures such as a review of guidance in the Highway Code to improve safety for vulnerable road users and enforcement against parking in mandatory cycle lanes. A comment from Brake was also included in the DfT’s official press release, demonstrating just how well respected we are as a key road safety organisation. Learn more: Read Brake’s response to the Cycling and Walking Investment Strategy consultation. Brake has launched its Light a Light campaign, to remember those whose lives were tragically cut short in a road crash. one in exchange for a donation to Brake. 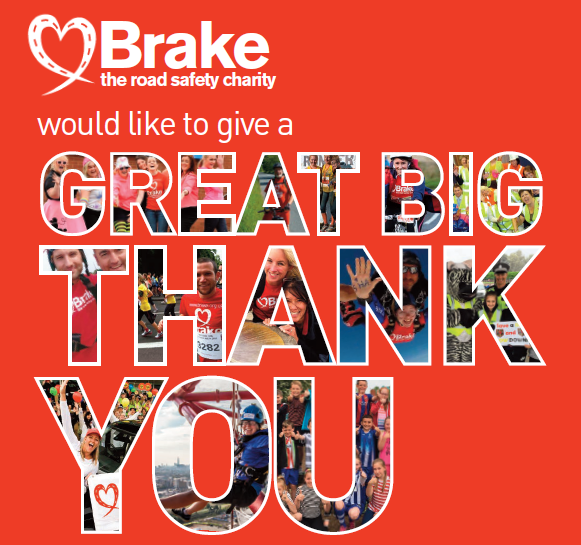 All moneys raised will help Brake to campaign for safer roads and support people who have been bereaved or injured in road crashes. Everyone who dedicates a light will receive a special remembrance candle in the post. 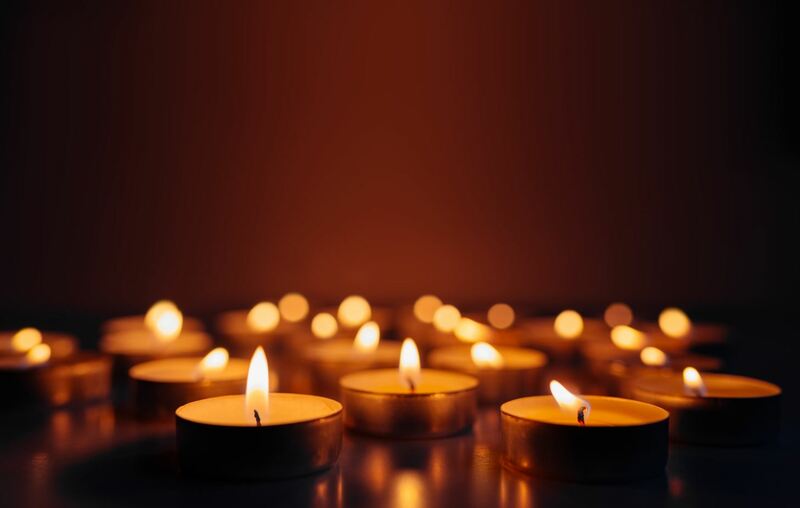 Get involved: Click here to light a candle for your loved one this Christmas. Christmas is (almost) here. Support Brake by buying a batch of our Charity Christmas cards. On sale now at just £3.50 for a pack of 10 cards. Get festive: Buy your Brake Christmas cards here. a factor in a large number of crashes. It can affect anyone, regardless of how experienced a driver they are. At-work drivers can be at even higher risk, especially if they spend long hours driving, drive at night, or have irregular sleep schedules. 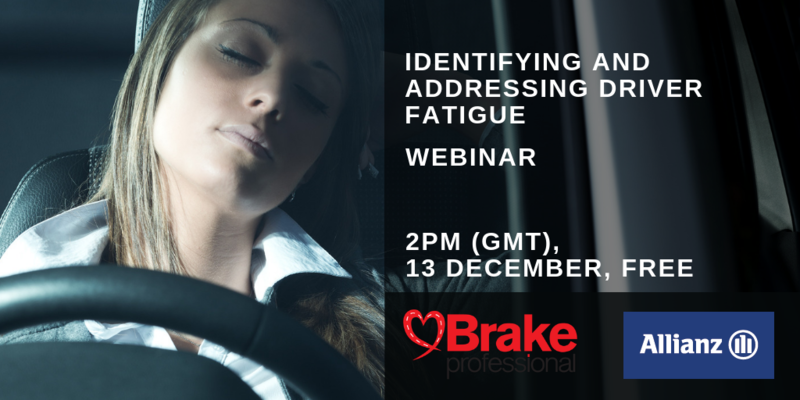 This free webinar will discuss the causes of driver fatigue, and the importance of including it in a road risk programme. Who should attend? Representatives of any organisation that employs at-work drivers, including fleet managers, health and safety managers and fleet suppliers. To register: Please complete our online form. This webinar is sponsored by Allianz and is free to attend. To learn more: Please visit the Brake Professional events calendar. Brake's accredited helpline is available to anyone in the UK who has been bereaved or seriously injured in a crash or their carers. Freephone 0808 8000 401 from 10am to 4pm Monday to Friday, or email helpline@brake.org.uk.